To design pants basic measurements the figures are poluobhvat waist (St), poluobhvat hips (Sa) and length (DB). 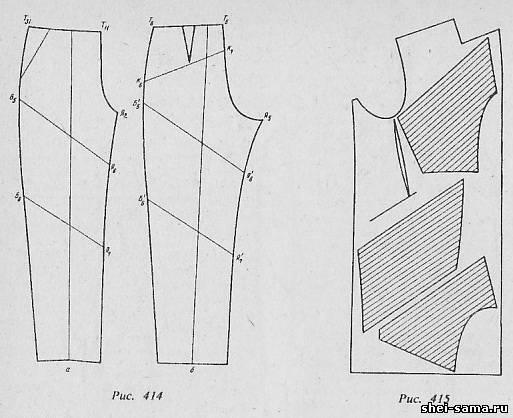 Design drawings of pants of various forms are built on a unified and constructive basis. By changing the allowances for free customized fit, you can get different shape of pants. The width of the pants at the bottom is determined in accordance with the fashionable silhouette and the individual data pieces. Builds a right angle with the apex at the point T (Fig. 412). From point T down is delayed a period T, determining the length of the piece cut CHA that determines the height of the seat. Up from the line of height of the seat is the cut that defines the position of the hip line, and a dot B. Through the points B, I, K and N are the horizontal lines. Then determines the fold line of the front halves of trousers. ЯЯ3 = ЯЯ2 1/2 X = 1/2 X 27.9 = 14 cm. Through the obtained point Я3 a vertical line of intersection of which with the lines of the waist, hips, seat height, knee and bottom respectively designate the points T2, B2, Я3, K1, H1. To the left of the point H2 is delayed a period equal to the width of the step is indicated by a point H1. From point H1 to a straight up ЯЯ1 is restored to the perpendicular, the point of intersection of which with the horizontal lines of the waist and hips are denoted by B1, T1. 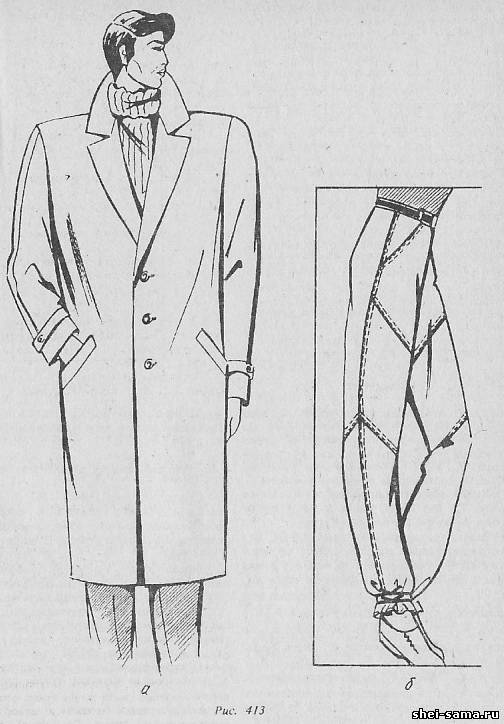 The width of the trousers-leg is determined by the model. 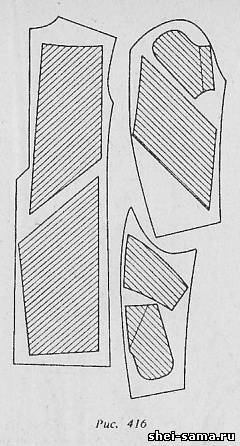 Girth of the hip (About) - at the level of the desired length pleats horizontally. Knee girth (Approx) - through the center of the kneecap horizontally. Girth under kalenom (DIC) - below the knee horizontally. Calf circumference (Og) - in the place of greatest development horizontally. The girth of the ankle (!) - over a foot at the narrowest point of the leg. These measurements are used depending on the shape and length of the pants. Н2Н3 = SN - 2 = 22 - 2 = 20 cm, where 2 is the difference between the width of the front and rear halves of the trousers-leg. From the point H1 to the left and right horizontal segments of the deposited Н1Н2 and Н1Н3 = - HN = Н2Н3 1/2 X = 1/2 X 20 = 10 cm. Width on the line of the knee (Wk) is determined by the model. It can be more or less of the width of the pants at the bottom, but should not be less than the measurement of leg circumference at the knee (Approx). For registration lateral and stepper sections of the front halves are the support point. К1К2 = К1КЗ = 11 cm. From the point T11 to the left horizontally is Т1Т3 cut that determines the width of the front halves of trousers on the waist line. Т11Т3 = 1/2 X (St + PT) + PR = 1/2 X (33,8 + 1) + 6 - 0,4 = 23,5 cm, where PR - the allowance for tucks. From the point T3 is delayed up to 0.5 cm, and raises the point T31. Point T11 and T31 are connected to a smooth line. The number, depth and design of the Darts on the waist line depend on the shape of the pants. For this option designed two pockets for 3 cm, one located at the fold line, the second at 2 cm from the first towards the side of the slice. 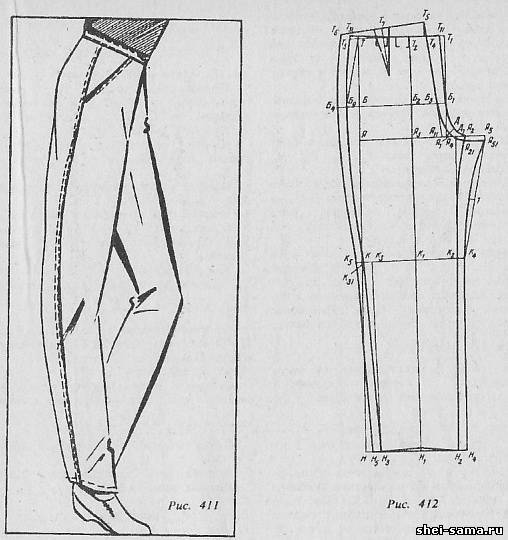 Side cut the front halves of trousers executed through the point T31, B0, K31, and H3 as shown in the drawing. the Back half of the pants. The position of the middle cut on the waist line defines the cut Т2Т4 equal Т2Т1/2. From point T4 is restored up to the perpendicular, which is the cut that determines the balance of the pants. Points T5 and Я11 connect the auxiliary straight line and at the intersection with the line of the hips is the point B3. The width of the step rear halves of the pants determines the length of Я1Я5 which is delayed from the point H1 to the right. To design middle seam are auxiliary segments Я2Д1 equal to 1 cm (on the bisector), and Я2Я21 equal to 1.3 cm, which lay down steps cut the front half. Я5Я51 = 1.2 cm down the perpendicular. Then determined the width of the rear halves of the pants to the hips. Т5Т6 = 1/2 X (St + PT) + PR + 0,5 = 1/2 X (33,8 + 1) +4,5 + 0,5 = 22,4 cm, where PR - stock on the tuck. The position of the point T6 find the intersection of two arcs: the arc from the point B4 with a radius equal Б0Т31, and an arc from point T5 with a radius equal Т5Т6. Lateral cut is made a convex line through the points TB, B4, K5, N5, from the knee down in a straight line, the bottom line is a straight line. For registration stepper cutoff point Я51 connects to the K4 point, then, is the point 1. Я151 = Я51К4/2. From point 1 to the left is delayed 1.3 cm (1 - 2 = 1.3 cm). Step cut is made concave line from point Я51 to C4 and from C4 to H4 in a straight line. Tuck design in the middle of the upper edge, perpendicular to the waist line - Т6Т7 = Т6Т5/2. the Old product (Fig. 413 a). Coat mens cotton-poly blend, straight-leg silhouette with set-in sleeves. On the shelves Welt pockets with leaflets. New product (Fig. 413 b). Pants for women, filled in the upper part by the soft tucks through the waist and increased the gain on the hips. The width of the pants at the bottom 22 cm of the Bottom of the pants decorated with opening width of 4 cm. The front half of the pants (Fig. 414 a). To build the front halves of trousers does the design of the pants, is outlined on paper, then applied decorative and constructive lines. To do this on the side seam is delayed from the point T31, down 24 cm and 55 cm, and put the points B5 and B6. Steps cut from the point H2 is delayed down 18 cm and 45 cm and put point AM6, Я7. The resulting points and AM6, B5, B6 and Я7 are connected by straight lines. Line pocket is 6.5 cm from the point T31 at the waist and 7 cm from the point B5 up on the side cut. The rear half of the pants (Fig. 414 b). To build the rear halves of the pants along the side slice is delayed from the point T6 downwards 18 cm, 24 cm and 55, put point K6, Б15 and B16. Steps cut the back half is delayed from the point Я51 18 cm and 45 cm, put point Я16 and Я17. The seam of the seat is delayed from point T5 8.5 cm and put a dot K7. Points K6 and K7, Б15 and Я16, B16 and Я17 are connected by straight lines. Decorative and constructive lines of details of the front and rear halves of the pants are cut. Width PATA 3.5 cm, length - 22 see the layout of parts cut are shown in figures 415, 416.